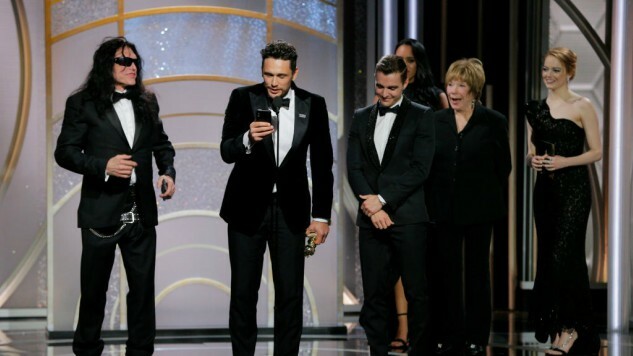 At last night’s Golden Globes, James Franco won Best Actor in a Motion Picture Musical or Comedy for playing Tommy Wiseau in The Disaster Artist. The film chronicles Tommy’s dream of making The Room, which has become one of the most celebrated cult films of all time. As Franco stepped onstage to accept his Golden Globe, he was joined by his brother, Dave Franco, and Wiseau himself. Franco was about to begin his acceptance speech when Tommy started going towards the microphone to say something. Franco then quickly pulled the microphone from Wiseau and began his speech thanking his brother, producer Seth Rogen and of course, the man himself, Tommy Wiseau. See for yourself below around the 30-second mark. Wiseau confirmed to the L.A. Times (via THR) that he was planning to say, “If a lot of people love each other the world will be a better place to live!” He later tweeted that remark instead. Wiseau praised Franco’s performance and the film, saying, “He did such a great job, talking as a director and an actor. I think he make a big effort, which sometimes from the outside is extremely difficult to understand that.” You can read Paste’s review of The Disaster Artist here. This was the second Golden Globe for James Franco—he previously won Best Actor in a Miniseries or TV Movie for his work on the 2001 TNT biopic James Dean. As for Wiseau, The Room will see its widest theatrical release ever this Wednesday, Jan. 10.